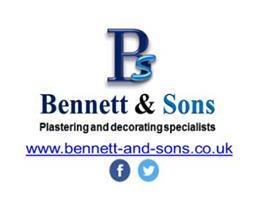 Bennett and Sons - Painter/Decorator, Plasterer based in Slough, Berkshire. Reliable and competitively priced . Offering a comprehensive range of services, from residential plastering and refurbishing to large scale commercial and industrial work. We are an established plastering and decorating specialist business - with 15 years plus experience, fully reliable, always clean and efficient. With extensive experience in the industry we are qualified and have worked on residential, commercial to overseas properties refurbishing chateau's, farmhouses and villa's. We pride ourselves on our professional service and maintaining the highest quality of work at very competitive prices. We provide great attention to detail and always able to accommodate each customers different needs. We can provide work related references if required.